By now we are well aware that college tuition continues to rise and consumers continue to take out hefty student loans to meet those growing costs. So it should come with relatively little surprise that the average debt graduates leave college with remains high; this year with an average of $28,400. The latest Institute for College Access & Success’ Project on Student Debt report [PDF] on student debt found that 69% of 2013 graduates of four-year public and nonprofit colleges owed an average of $28,400, up 2% compared to $27,850 in 2012. While it was previously reported that in 2012 71% of students graduated with an average debt of $29,400, that statistic included the debt of graduates from for-profit schools. The latest study does not include debt rates for for-profit colleges because most choose not to report what their graduates owe. However, the most recent data covering for-profit institutions found that graduates owed 43% more than their counterparts graduating at public and nonprofit colleges. In addition to the higher level of student loan debt, recent college graduates continue to face relatively high levels of unemployment or underemployment in 2013, with 16.8% of students claiming to be unemployed, working fewer hours than they wanted, or that they had given up looking for a job. Still, those students face an easier time finding employment than consumers who only have a high school diploma. According to the TICAS report, the average student’s graduating debt varies drastically at the state level from $18,656 to $32,795. In six states the average debt topped more than $30,000 and only one state had debt under $20,000. Students graduating for colleges in New Hampshire had the highest average debt in 2013, at $32,795. Close behind is Delaware, which was the highest debt state in 2012, with an average debt of $32,571. Nearly all the highest debt states are in the Northeast and Midwest, with the lowest debt states in the West and South. Students graduating in New Mexico have the lowest debt – the only state under $20,000 – with the average of $18,656. “The importance of state policy and investment cannot be overstated when it comes to student debt levels,” Debbie Cochrane, research director at TICAS and coauthor of the report, says in a statement. A students’ choice in college also plays a significant part in their eventual debt loads. Debt from college to college varied from $2,500 to $71,000. Colleges with higher costs tend to have higher average debt at graduation, but not all high-debt colleges are high-cost. For example, Princeton University once again makes the list of low-debt schools because of the school’s pledge to meet the full of tuition with grants and/or a limited amount of work. Despite a total annual cost of $54,780 to 2013 graduates, the average student loan debt held by the Ivy League school’s graduates was only $5,552. TICAS suggests that the school’s 24% of students taking out loans do so to help cover the expected family contribution or to reduce the need to work. 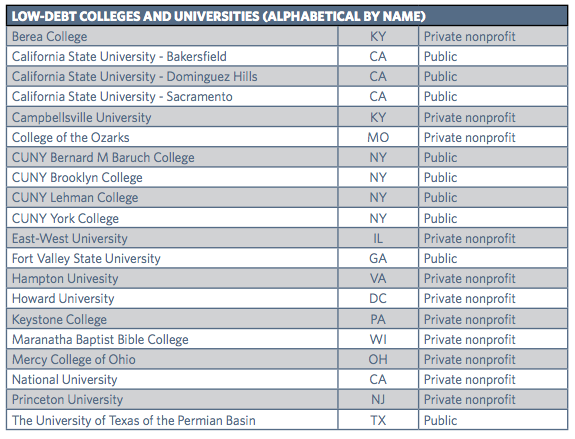 Additionally, 14 of the 40 high-debt colleges – four public and 10 nonprofit – have tuition and fees below the national average for their sector. The composition of graduates’ debt also varied. Almost half of the 40 high-debt colleges and eight of the 20 low-debt colleges, and more than one-third of graduates’ debt came from private loans. TICAS once again created a pretty awesome interactive map that not only shows info for each state, but more granular information about costs and student loan debt averages for all the schools that reported this information in 2013. Based on the reports findings, officials with TICAS recommend that several options as a way to reduce the burden of student debt. • Reduce the need to borrow: at the federal level, we recommend making more need-based grant aid available and containing up-front costs to reduce how much low- and moderate-income students need to borrow. This could include increasing Pell Grants and preventing state disinvestments. • Help keep loan payments manageable: Simplifying and raising awareness of repayment plans will help borrowers make informed and affordable repayment choices before they default. • Help students and families make informed choices: Provide information and data that can assist families and students in making wise decisions about where to go to college and how to pay for it, students and families need clear, timely, accurate, and comparable information about costs, financial aid, and typical outcomes. • Strengthen college accountability: There should be more consequences for schools that fail to graduate large shares of students or consistently leave students with debts that cannot be repaid. To do so, regulators should end eligibility of federal aid or provide rewards depending on a school’s default risk and default rates. • Reduce risky private loan borrowing: Require school certification of private loans, creating a market for refinancing private loans, restoring fair bankruptcy treatment for private loan borrowers, and encouraging community colleges to participate in the federal loan program. In addition to policy recommendations, TICAS called for better debt data from colleges. 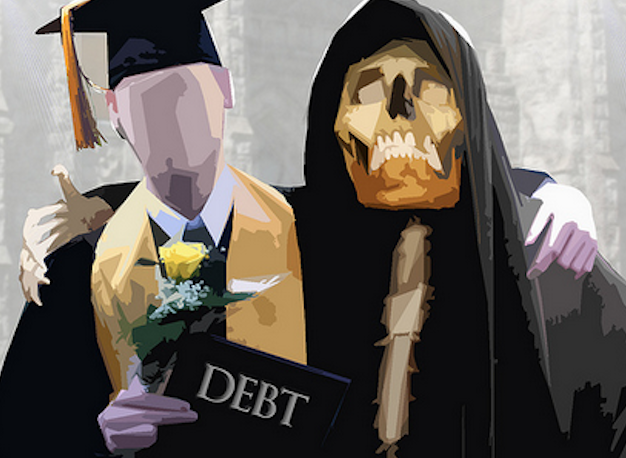 Because colleges are not required to report debt levels for their graduates, only some do. And even those that do provide the stat may underestimate graduates’ debt loads if they are unaware of private loans.